Click on the Course you wish to view progress for. Under each Section card, you will see a series of boxes that indicate how many students are registered, as well as their averages on each item type. Click on the Section card to see more information about each from the Coursework tab. You can drill down into students’ performance by clicking the Students tab in the Section. You can see student progress for each Learning Objective and quickly identify students that may need additional assistance. You can even click on a student’s name to view a detailed breakdown of the questions answered correctly (green) or incorrectly (red), as well as the instructional pieces of content the student has viewed (blue). Click on any question in the Learning Activity table to view the student’s response. To change the order of assignments, simply click the down arrow next to the drop-down menu above your assignment list. 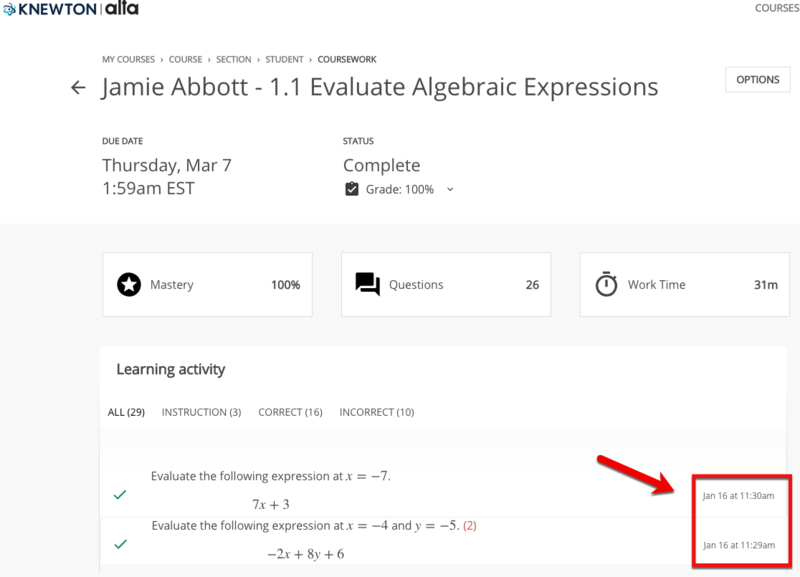 You can also see a timestamp on the right of the activity item to show the exact time of the student completed that item. This information shows in assignments, as well as tests and quizzes. You can see how students have fared (number of correct and incorrect responses) and easily compare that to the class average. You can also view detailed performance reports for students by clicking on their name. To view course progress by student, use your Students dashboard. You can read more about the Student dashboard here! At any time, to navigate back to your list of students, click the back button next to your section name or section, then the Students tab at the top of the page.